Joel Embiid, at his best, is fearsome the way Shaquille O’Neal was. He makes you marvel at his power, his agility and his skill level. No matter how many times he executes a Eurostep at full speed, it will never seem remotely normal for a person of his size to be capable of doing so. He can make defenders look helpless, and the Brooklyn Nets have had no luck trying to defend him one-on-one. In four games against Brooklyn during the regular season, Embiid averaged 30 points on 60 percent shooting, with 14.3 rebounds, 5.0 assists and 1.3 blocks in 33.5 minutes. He got to the free throw line 11.5 times a game, and he had a true shooting percentage of 70.4 percent. The Nets’ centers — Jarrett Allen and Ed Davis — have all sorts of positive attributes, but they cannot match Embiid’s strength, nor can they force him to defend the perimeter. Brooklyn will likely throw lots of double-teams at him, testing his improved but imperfect court awareness. 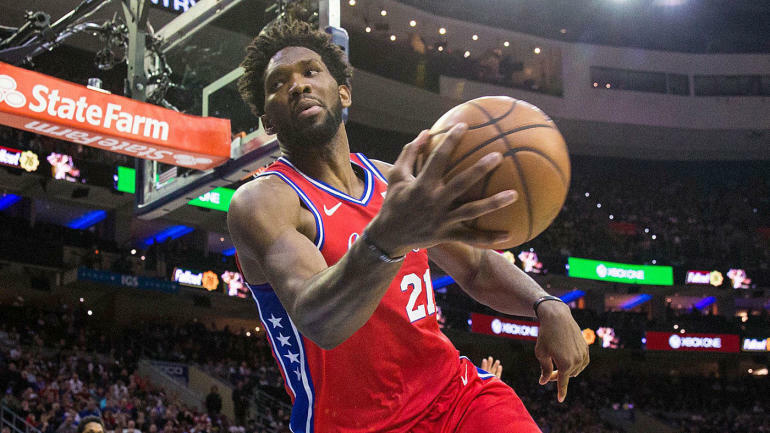 If he can limit his turnovers and make them pay, it indicates not only that the Sixers can advance in short order, but that he can fare well in tougher matchups. This will be more difficult if his left knee is balky, and it would be nice to know if that is the case. Patrick Beverley appeared to give Jae Crowder some pointers on defending James Harden on Wednesday, but all the advice in the world doesn’t mean much if the MVP candidate finds a rhythm and knocks down a couple of stepback 3s to break a game open. In last year’s second-round series, Harden didn’t shoot all that efficiently, but, with him on the court, the Houston Rockets scored 115.6 points per 100 possessions and had a net rating of plus-19.2. The Utah Jazz have built an elite defense around Rudy Gobert, but this matchup is not friendly to them. They know that Harden and Chris Paul, who completely destroyed them last time, will target Gobert in pick-and-rolls over and over again. Last season’s series was over in five games, and all of Houston’s wins were by double-digits. If you believe this will be different, it is probably because you believe that the Rockets will be worse on defense without Trevor Ariza or the Jazz will be better on offense because of Donovan Mitchell’s improvement. In the 24 games after the All-Star break, Mitchell averaged 26.7 points, 4.6 assists and 4.5 rebounds while shooting 46.1 percent and making 45.1 percent of his 3s. Mitchell’s playoff run last season was impressive, but he was nowhere near this efficient and he only made a quarter of his 3-point attempts. Let’s see what he and his team have learned since then. This Denver Nuggets vs. San Antonio Spurs series isn’t your typical 2-7 matchup. Their offensive ratings are almost identical, and there is skepticism that the Nuggets’ 10th-ranked defense can keep it up in the postseason. They made massive strides on that end, which explains how they went from losing a play-in game to competing for the top seed, but, for months, there has been a sense that no one in the West is all that scared of them. Denver is not a particularly switchy team and its best player is a clunky perimeter defender. These deficiencies might not matter in this matchup, though, for a straightforward reason: The Spurs have been significantly worse and less consistent than the Nuggets on defense. For all of Derrick White’s brilliance, San Antonio finished the season 20th in defensive rating, and it’s unclear whether this version of the team can be trusted to elevate its execution in the playoffs like a classic Gregg Popovich-coached squad. There is a world in which this is the best series of the first round, and there is also one where Nikola Jokic picks the Spurs apart with relative ease. Indiana’s offensive style is a lot like San Antonio’s: It finished fourth in the league in field goal percentage, but rarely got to the line and shot a minuscule amount of 3s. The Pacers prioritize open shots from wherever they can get them, rather than hunting 3s and layups. The key difference is that the Spurs bucked trends en route to the sixth-best offense in the league, while Indiana finished 18th in offensive rating despite forcing way more turnovers. The emergence of Bojan Bogdanovic as a primary playmaker should be celebrated, as should the team’s collective resilience and problem-solving in the aftermath of Victor Oladipo’s devastating injury. Even with Smart out of the picture, though, the Celtics have the personnel to gum up the Pacers’ system with switching. There will be lots of playmaking pressure on Bogdanovic and center Domantas Sabonis, who serves as the hub of a lot of their activity when he checks in off the bench. This would be a convenient time for Tyreke Evans to make Indiana forget about his disappointing regular season. The staggering thing about Kawhi Leonard’s season is that he so clearly hasn’t been going full-tilt. “There may be another gear here,” Toronto Raptors coach Nick Nurse said Thursday, per Yahoo Sports’ William Lou, and he was talking about a player who averaged career highs of 26.6 points and 7.3 rebounds, with a 60.6 percent true shooting percentage. It is true, though: All year long, Leonard picked his spots. He rarely guarded the opposing team’s best player. He said that he saw regular-season games as practices. He missed 22 games because he wanted his knee to feel good now. According to him, it does. It is time, then, for Leonard to make the Orlando Magic terrified of even dribbling the ball near him. It’s time for him to put as much pressure as he can on their conservative defensive scheme. The last time he was in the playoffs, he played the best basketball of his life and made you wonder if he might be the best player on the planet. The Raptors don’t need Leonard to reach that level to get past Orlando, but it would bode well for their chances of getting to the Finals. 7. What’s next on The Giannis Show? The Detroit Pistons don’t have the personnel to challenge the Milwaukee Bucks, especially now that Blake Griffin — far and away their most important player — is dealing with a knee injury. I am curious, though, about whether they can at least make Giannis Antetokounmpo uncomfortable. My guess is no. Antetokounmpo wrecked the Pistons just like he wrecked everybody else in the regular season, and it didn’t matter that Detroit assistant coach Sean Sweeney (formerly of the Bucks) knows the intricacies of his game as well as anyone in the NBA. I fully expect Antetokounmpo to trample this team, but if he misses a couple of wide-open, we-dare-you-to-take-it 3s, the whole league will be watching to see if he takes the next one. It’s easy to count out the Portland Trail Blazers. The Jusuf Nurkic injury weakened them on both ends and might have made this matchup into a nightmare, particularly because of the way the Oklahoma City Thunder play. C.J. McCollum just returned from a knee injury, and he and Damian Lillard will have to deal with the same kind of aggressive, physical, trapping defense that threw them off balance in last year’s first-round sweep. Wouldn’t it be remarkable, though, if Lillard and the Blazers rose to the occasion? They responded to that New Orleans Pelicans sweep better than anyone could have hoped. They have been waiting a whole year to redeem themselves. In a roundabout way, the Nurkic injury might empower them to be bolder and freer. I’d love to see Lillard get more aggressive than ever with his shot selection and Terry Stotts get weird with his rotation. Things broke well for Oklahoma City, as it has a path to the conference finals that doesn’t go through the Rockets or the defending champs. It won’t be considered a real upset if it beats the No. 3-seeded Blazers, who are banged-up and had no answers for Paul George during the regular season. The Thunder, however, have yet to prove that they can be trusted. There were times when Oklahoma City looked like a fringe contender, making up for its iffy shooting with pace, rebounding and, for a long stretch, the best defense in the league. There were also times when it looked inept on offense, average on defense and fundamentally flawed. This version of the Thunder is extremely dependent on George, whose shoulder remains a concern, and they are vulnerable if their role players aren’t making 3-pointers. There is upside here, but they need to figure things out offensively, which starts with George consistently playing the way he did when he was in the MVP conversation. There is no such buzz here, but that doesn’t mean we can’t learn anything about the Warriors. This is an interesting series for DeMarcus Cousins — Williams isn’t Harden, but he’ll target Cousins in pick-and-rolls the same way. Golden State must hope that the big man can stay on the floor and punish the Clippers’ bigs on the other end. This is theoretically a pretty good matchup for him, and it would be an even better one if he starts making more of his 3s. 11. How will Philadelphia deal with Brooklyn’s guards? You have to appreciate Brett Brown’s candor. The Philadelphia 76ers coach called a potential matchup with the Brooklyn Nets “dangerous” and “scary” a couple of weeks ago, and he talked in detail about the problems they present in the pick-and-roll after their regular-season finale. The Sixers need to decide not only who will be the primary defender against D’Angelo Russell — there are a handful of imperfect options — but how they will respond if Brooklyn exploits their preference for stationing Embiid near the rim. What makes the Nets so difficult is that it’s not just about stopping Russell from finding a rhythm. Spencer Dinwiddie is a significantly more efficient creator in pick-and-roll and isolation, and Caris LeVert has looked much closer to his early-season self lately. All season, Philadelphia has had trouble with guards who create off the bounce, and Brooklyn averaged 53.2 drives a game, which ranks third in the league, per NBA.com. This challenge is a microcosm of the Sixers’ larger issue: They have immense talent, but they also have weak spots. In the playoffs, opponents will mercilessly hammer those weak spots.